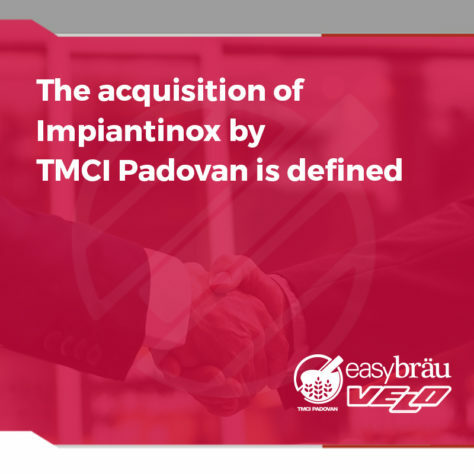 As anticipated in the communication issued on April 27, 2018, the transaction regarding the acquisition of the company Impiantinox Srl (holder of the EasyBräu brand) by the TMCI Padovan group was officially announced. The completion of the closing operation is expected in September. This operation was carried out with great satisfaction by both companies, with the aim of establishing itself as an Italian leader in the production of craft beer systems. And with this spirit we are therefore pleased to present the result of this important union: the new brand EASYBRÄU-VELO; a brand that represents the experience and reliability gained in decades of activity in the field of process plants, united technological innovation and the quality of the materials used.